For the American thrash metal band, see Angkor Wat (band). Angkor Wat (/ˌæŋkɔːr ˈwɒt/; Khmer: អង្គរវត្ត, "City/Capital of Temples") is a temple complex in Cambodia and one of the largest religious monuments in the world, on a site measuring 162.6 hectares (1,626,000 m2; 402 acres). Originally constructed as a Hindu temple dedicated to the god Vishnu for the Khmer Empire, it was gradually transformed into a Buddhist temple towards the end of the 12th century. It was built by the Khmer King Suryavarman II in the early 12th century in Yaśodharapura (Khmer: យសោធរបុរៈ, present-day Angkor), the capital of the Khmer Empire, as his state temple and eventual mausoleum. Breaking from the Shaiva tradition of previous kings, Angkor Wat was instead dedicated to Vishnu. As the best-preserved temple at the site, it is the only one to have remained a significant religious centre since its foundation. The temple is at the top of the high classical style of Khmer architecture. It has become a symbol of Cambodia, appearing on its national flag, and it is the country's prime attraction for visitors. The modern name, Angkor Wat (Khmer: អង្គរវត្ត) (alternate name: Nokor Wat, Khmer: នគរវត្ត), means "Temple City" or "City of Temples" in Khmer; Angkor (Khmer: អង្គរ) meaning "city" or "capital city", is a vernacular form of the word nokor (Khmer: នគរ), which comes from the Sanskrit word nagara (Devanāgarī: नगर). Wat (Khmer: វត្ត) is the Khmer word for "temple grounds", also derived from Sanskrit vāṭa (Devanāgarī: वाट), meaning "enclosure". The original name of the temple was Vrah Viṣṇuloka or Parama Viṣṇuloka (Sanskrit), (Khmer: បរមវិស្ណុលោក – Barom Visnulōk) which means the sacred dwelling of Vishnu. According to legend, the construction of Angkor Wat was ordered by Indra to serve as a palace for his son Precha Ket Mealea. According to the 13th-century Chinese traveller Zhou Daguan, some believed that the temple was constructed in a single night by a divine architect. The initial design and construction of the temple took place in the first half of the 12th century, during the reign of Suryavarman II (ruled 1113 – c. 1150). Dedicated to Vishnu, it was built as the king's state temple and capital city. As neither the foundation stela nor any contemporary inscriptions referring to the temple have been found, its original name is unknown, but it may have been known as "Varah Vishnu-lok" after the presiding deity. Work seems to have ended shortly after the king's death, leaving some of the bas-relief decoration unfinished. In 1177, approximately 27 years after the death of Suryavarman II, Angkor was sacked by the Chams, the traditional enemies of the Khmer. Thereafter the empire was restored by a new king, Jayavarman VII, who established a new capital and state temple (Angkor Thom and the Bayon respectively) a few kilometres to the north. Towards the end of the 12th century, Angkor Wat gradually transformed from a Hindu centre of worship to Buddhism, which continues to the present day. Angkor Wat is unusual among the Angkor temples in that although it was largely neglected after the 16th century it was never completely abandoned. Fourteen inscriptions dated from the 17th century discovered in Angkor area testify to Japanese Buddhist pilgrims that had established small settlements alongside Khmer locals. At that time, the temple was thought by the Japanese visitors as the famed Jetavana garden of the Buddha, which originally located in the kingdom of Magadha, India. The best-known inscription tells of Ukondafu Kazufusa, who celebrated the Khmer New Year at Angkor Wat in 1632. One of the first Western visitors to the temple was António da Madalena, a Portuguese friar who visited in 1586 and said that it "is of such extraordinary construction that it is not possible to describe it with a pen, particularly since it is like no other building in the world. It has towers and decoration and all the refinements which the human genius can conceive of." Angkor Wat may relate to the architecture of the Greek and Roman record explored in terms of the west rather than east orientation of the temple. Some architects have written that it is 'correct' for the construction to be facing to the west. In temple orientations for the Greek and Etruscan context, west is associated with "right" and the "underworld" to suggest a religious connection of the building. Mouhot, like other early Western visitors, found it difficult to believe that the Khmers could have built the temple and mistakenly dated it to around the same era as Rome. His reports inspired the French government, already an established presence in Indochina, to begin a systematic study of the ruins. The true history of Angkor Wat was pieced together from stylistic and epigraphic evidence accumulated during subsequent clearing and restoration work. There were no ordinary dwellings or houses or other signs of settlement, including cooking utensils, weapons, or items of clothing usually found at ancient sites. Instead there is only the evidence of the monuments themselves. An exploration commission began drawing up a list of principal monuments. Subsequent missions copied inscriptions written on Angkor buildings so scholars might translate them and learn something of Angkor's history. By 1885 they had worked up a chronology of the rulers and developed the outlines of a description of the civilization that had produced the temple complex. In 1898 the French decided to commit substantial funds to Angkor's preservation. Centuries of neglect had permitted the jungle to recapture many of the more significant structures, and unless efforts were made to free the buildings from the embrace of huge banyan and silk-cotton trees, they might soon be crushed to destruction. The 20th century saw considerable restoration of Angkor Wat. Gradually teams of laborers and archeologists pushed back the jungle and exposed the expanses of stone, permitting the sun once again to illuminate the dark corners of the temple. Work was interrupted by the Cambodian Civil War and Khmer Rouge control of the country during the 1970s and 1980s, but relatively little damage was done during this period. Camping Khmer Rouge forces used whatever wood remained in the building structures for firewood, and a shoot-out between Khmer Rouge and Vietnamese forces put a few bullet holes in a bas relief. Far more damage was done after the wars, by art thieves working out of Thailand, which, in the late 1980s and early 1990s, claimed almost every head that could be lopped off the structures, including reconstructions. The temple is a powerful symbol of Cambodia, and is a source of great national pride that has factored into Cambodia's diplomatic relations with France, the United States and its neighbour Thailand. A depiction of Angkor Wat has been a part of Cambodian national flags since the introduction of the first version circa 1863. From a larger historical and even transcultural perspective, however, the temple of Angkor Wat did not become a symbol of national pride sui generis but had been inscribed into a larger politico-cultural process of French-colonial heritage production in which the original temple site was presented in French colonial and universal exhibitions in Paris and Marseille between 1889 and 1937. Angkor Wat's aesthetics were also on display in the plaster cast museum of Louis Delaporte called musée Indo-chinois which existed in the Parisian Trocadero Palace from c.1880 to the mid-1920s. The splendid artistic legacy of Angkor Wat and other Khmer monuments in the Angkor region led directly to France adopting Cambodia as a protectorate on 11 August 1863 and invading Siam to take control of the ruins. This quickly led to Cambodia reclaiming lands in the northwestern corner of the country that had been under Siamese (Thai) control since AD 1351 (Manich Jumsai 2001), or by some accounts, AD 1431. 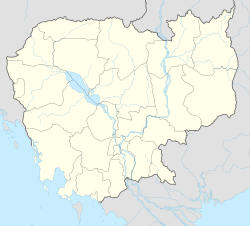 Cambodia gained independence from France on 9 November 1953 and has controlled Angkor Wat since that time. It is safe to say that from the colonial period onwards until the site's nomination as UNESCO World Heritage in 1992, this specific temple of Angkor Wat was instrumental in the formation of the modern and gradually globalised concept of built cultural heritage. In December 2015, it was announced that a research team from University of Sydney had found a previously unseen ensemble of buried towers built and demolished during the construction of Angkor Wat, as well as massive structure of unknown purpose on its south side and wooden fortifications. The findings also include evidence of low-density residential occupation in the region, with a road grid, ponds and mounds. These indicate that the temple precinct, bounded by moat and wall, may not have been used exclusively by the priestly elite, as was previously thought. The team used LiDAR, ground-penetrating radar and targeted excavation to map Angkor Wat. Angkor Wat, located at 13°24′45″N 103°52′0″E﻿ / ﻿13.41250°N 103.86667°E﻿ / 13.41250; 103.86667, is a unique combination of the temple mountain (the standard design for the empire's state temples) and the later plan of concentric galleries. The construction of Angkor Wat also suggests that there was a celestial significance with certain features of the temple. This is observed in the temple's east-west orientation, and lines of sight from terraces within the temple that show specific towers to be at the precise location of the sunrise on a solstice. The temple is a representation of Mount Meru, the home of the gods: the central quincunx of towers symbolises the five peaks of the mountain, and the walls and moat symbolise the surrounding mountain ranges and ocean. Access to the upper areas of the temple was progressively more exclusive, with the laity being admitted only to the lowest level. A further interpretation of Angkor Wat has been proposed by Eleanor Mannikka. Drawing on the temple's alignment and dimensions, and on the content and arrangement of the bas-reliefs, she argues that the structure represents a claimed new era of peace under King Suryavarman II: "as the measurements of solar and lunar time cycles were built into the sacred space of Angkor Wat, this divine mandate to rule was anchored to consecrated chambers and corridors meant to perpetuate the king's power and to honour and placate the deities manifest in the heavens above." Mannikka's suggestions have been received with a mixture of interest and scepticism in academic circles. 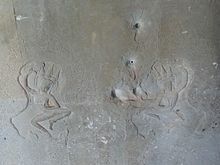 She distances herself from the speculations of others, such as Graham Hancock, that Angkor Wat is part of a representation of the constellation Draco. The Angkor Wat temple's main tower aligns to the morning sun of the Spring Equinox. The outer wall, 1,024 m (3,360 ft) by 802 m (2,631 ft) and 4.5 m (15 ft) high, is surrounded by a 30 m (98 ft) apron of open ground and a moat 190 m (620 ft) wide and over 5 kilometres (3 mi) in perimeter. Access to the temple is by an earth bank to the east and a sandstone causeway to the west; the latter, the main entrance, is a later addition, possibly replacing a wooden bridge. There are gopuras at each of the cardinal points; the western is by far the largest and has three ruined towers. Glaize notes that this gopura both hides and echoes the form of the temple proper. Under the southern tower is a statue of Vishnu, known as Ta Reach, which may originally have occupied the temple's central shrine. Galleries run between the towers and as far as two further entrances on either side of the gopura often referred to as "elephant gates", as they are large enough to admit those animals. These galleries have square pillars on the outer (west) side and a closed wall on the inner (east) side. The ceiling between the pillars is decorated with lotus rosettes; the west face of the wall with dancing figures; and the east face of the wall with balustered windows, dancing male figures on prancing animals, and devatas, including (south of the entrance) the only one in the temple to be showing her teeth. The middle tower of Angkor Wat symbolizes the sacred mountain, mount Meru. Aerial view of the central structure; in front of the central structure lies the cruciform terrace. On the eastern gallery is one of the most celebrated scenes, the Churning of the Sea of Milk, showing 92 asuras and 88 devas using the serpent Vasuki to churn the sea under Vishnu's direction (Mannikka counts only 91 asuras, and explains the asymmetrical numbers as representing the number of days from the winter solstice to the spring equinox, and from the equinox to the summer solstice). It is followed by Vishnu defeating asuras (a 16th-century addition). The northern gallery shows Krishna's victory over Bana (where according to Glaize, "The workmanship is at its worst"). Angkor Wat is decorated with depictions of apsaras and devata; there are more than 1,796 depictions of devata in the present research inventory. Angkor Wat architects employed small apsara images (30 cm (12 in)–40 cm (16 in)) as decorative motifs on pillars and walls. They incorporated larger devata images (all full-body portraits measuring approximately 95 cm (37 in)–110 cm (43 in)) more prominently at every level of the temple from the entry pavilion to the tops of the high towers. In 1927, Sappho Marchal published a study cataloging the remarkable diversity of their hair, headdresses, garments, stance, jewellery and decorative flowers, which Marchal concluded were based on actual practices of the Angkor period. The monument was made out of 5 million to 10 million sandstone blocks with a maximum weight of 1.5 tons each. In fact, the entire city of Angkor used up far greater amounts of stone than all the Egyptian pyramids combined, and occupied an area significantly greater than modern-day Paris. Moreover, unlike the Egyptian pyramids which use limestone quarried barely 0.5 km (0.31 mi) away all the time, the entire city of Angkor was built with sandstone quarried 40 km (25 mi) (or more) away. This sandstone had to be transported from Mount Kulen, a quarry approximately 25 miles (40 km) to the northeast. The route has been suggested to span 35 kilometres (22 mi) along a canal towards Tonlé Sap lake, another 35 kilometres (22 mi) crossing the lake, and finally 15 kilometres (9.3 mi) against the current along Siem Reap River, making a total journey of 90 kilometres (56 mi). However, Etsuo Uchida and Ichita Shimoda of Waseda University in Tokyo, Japan have discovered in 2011 a shorter 35-kilometre (22 mi) canal connecting Mount Kulen and Angkor Wat using satellite imagery. The two believe that the Khmer used this route instead. Virtually all of its surfaces, columns, lintels and even roofs are carved. There are miles of reliefs illustrating scenes from Indian literature including unicorns, griffins, winged dragons pulling chariots as well as warriors following an elephant-mounted leader and celestial dancing girls with elaborate hair styles. The gallery wall alone is decorated with almost 1,000 square metres of bas reliefs. Holes on some of the Angkor walls indicate that they may have been decorated with bronze sheets. These were highly prized in ancient times and were a prime target for robbers. While excavating Khajuraho, Alex Evans, a stonemason and sculptor, recreated a stone sculpture under 4 feet (1.2 m), this took about 60 days to carve. Roger Hopkins and Mark Lehner also conducted experiments to quarry limestone which took 12 quarrymen 22 days to quarry about 400 tons of stone. The labour force to quarry, transport, carve and install so much sandstone must have run into the thousands including many highly skilled artisans. The skills required to carve these sculptures were developed hundreds of years earlier, as demonstrated by some artefacts that have been dated to the seventh century, before the Khmer came to power. As with most other ancient temples in Cambodia, Angkor Wat has faced extensive damage and deterioration by a combination of plant overgrowth, fungi, ground movements, war damage and theft. The war damage to Angkor Wat's temples however has been very limited, compared to the rest of Cambodia's temple ruins, and it has also received the most attentive restoration. A vandalized pillar at Angkor Wat inscribed with the names of Mainland Chinese tourists. The restoration of Angkor Wat in the modern era began with the establishment of the Conservation d'Angkor (Angkor Conservancy) by the École française d'Extrême-Orient (EFEO) in 1908; before that date, activities at the site were primarily concerned with exploration. The Conservation d'Angkor was responsible for the research, conservation, and restoration activities carried out at Angkor until the early 1970s, and a major restoration of Angkor was undertaken in the 1960s. However, work on Angkor was abandoned during the Khmer Rouge era and the Conservation d'Angkor was disbanded in 1975. Between 1986 and 1992, the Archaeological Survey of India carried out restoration work on the temple, as France did not recognise the Cambodian government at the time. Criticism has been raised about both the early French restoration attempts and particularly the later Indian work, with concerns over damage done to the stone surface by the use of chemicals and cement. The restored head of a naga beside an unrestored lion at the start of the causeway leading to the entrance of Angkor Wat. The contrast of restored and unrestored figures is deliberate. The major restoration of the causeway was first initiated in the 1960s by the French. In 1992, following an appeal for help by Norodom Sihanouk, Angkor Wat was listed in UNESCO's World Heritage in Danger (later removed in 2004) and World Heritage Site together with an appeal by UNESCO to the international community to save Angkor. Zoning of the area was set up to protect the Angkor site in 1994, APSARA was established in 1995 to protect and manage the area, and a law to protect Cambodian heritage was passed in 1996. A number of countries such as France, Japan and China are currently involved in various Angkor Wat conservation projects. The German Apsara Conservation Project (GACP) is working to protect the devatas, and other bas-reliefs which decorate the temple, from damage. The organisation's survey found that around 20% of the devatas were in very poor condition, mainly because of natural erosion and deterioration of the stone but in part also due to earlier restoration efforts. Other work involves the repair of collapsed sections of the structure, and prevention of further collapse: the west facade of the upper level, for example, has been buttressed by scaffolding since 2002, while a Japanese team completed restoration of the north library of the outer enclosure in 2005. World Monuments Fund began conservation work on the Churning of the Sea of Milk Gallery in 2008 after several years of studies on its condition. The project restored the traditional Khmer roofing system and removed cement used in earlier restoration attempts that had resulted in salts entering the structure behind the bas-relief, discoloring and damaging the sculpted surfaces. The main phase of work ended in 2012, with the final component being the installation of finials on the roof of the gallery in 2013. Microbial biofilms have been found degrading sandstone at Angkor Wat, Preah Khan, and the Bayon and West Prasat in Angkor. The dehydration- and radiation-resistant filamentous cyanobacteria can produce organic acids that degrade the stone. A dark filamentous fungus was found in internal and external Preah Khan samples, while the alga Trentepohlia was found only in samples taken from external, pink-stained stone at Preah Khan. Replicas were also made to replace some of the lost or damaged sculptures. Since the 1990s, Angkor Wat has become a major tourist destination. In 1993, there were only 7,650 visitors to the site; by 2004, government figures show that 561,000 foreign visitors had arrived in Siem Reap province that year, approximately 50% of all foreign tourists in Cambodia. The number reached over a million in 2007, and over two million by 2012. Most visited Angkor Wat, which received over two million foreign tourists in 2013. The site has been managed by the private SOKIMEX group since 1990, which rented it from the Cambodian government. The influx of tourists has so far caused relatively little damage, other than some graffiti; ropes and wooden steps have been introduced to protect the bas-reliefs and floors, respectively. Tourism has also provided some additional funds for maintenance—as of 2000 approximately 28% of ticket revenues across the whole Angkor site was spent on the temples—although most work is carried out by teams sponsored by foreign governments rather than by the Cambodian authorities. Since Angkor Wat has seen significant growth in tourism throughout the years, UNESCO and its International Co-ordinating Committee for the Safeguarding and Development of the Historic Site of Angkor (ICC), in association with representatives from the Royal Government and APSARA, organised seminars to discuss the concept of "cultural tourism". Wanting to avoid commercial and mass tourism, the seminars emphasised the importance of providing high quality accommodation and services in order for the Cambodian government to benefit economically, while also incorporating the richness of Cambodian culture. In 2001, this incentive resulted in the concept of the "Angkor Tourist City" which would be developed with regard to traditional Khmer architecture, contain leisure and tourist facilities, and provide luxurious hotels capable of accommodating large numbers of tourists. The prospect of developing such large tourist accommodations has encountered concerns from both APSARA and the ICC, claiming that previous tourism developments in the area have neglected construction regulations and more of these projects have the potential to damage landscape features. Also, the large scale of these projects have begun to threaten the quality of the nearby town's water, sewage, and electricity systems. It has been noted that such high frequency of tourism and growing demand for quality accommodations in the area, such as the development of a large highway, has had a direct effect on the underground water table, subsequently straining the structural stability of the temples at Angkor Wat. Locals of Siem Reap have also voiced concern that the charm and atmosphere of their town have been compromised in order to entertain tourism. Since this local atmosphere is the key component to projects like Angkor Tourist City, the local officials continue to discuss how to successfully incorporate future tourism without sacrificing local values and culture. At the ASEAN Tourism Forum 2012, it was agreed that Borobudur and Angkor Wat would become sister sites and the provinces sister provinces. ^ "Largest religious structure". Guinness World Records. Retrieved 29 April 2016. ^ a b Ashley M. Richter (8 September 2009). "Recycling Monuments: The Hinduism/Buddhism Switch at Angkor". CyArk. Retrieved 7 June 2015. ^ Higham, C. (2014). Early Mainland Southeast Asia. Bangkok: River Books Co., Ltd. pp. 372, 378–379. ISBN 978-616-7339-44-3. ^ "Government : Cambodia". CIA World Factbook. ^ "Cambodia's Angkor Wat Breaking Records for Visitors Again | News from Tourism Cambodia". Tourism of Cambodia. ^ a b Jarus, Owen (5 April 2018). "Angkor Wat: History of Ancient Temple". Live Science. Purch. Retrieved 28 July 2018. ^ J. Hackin; Clayment Huart; Raymonde Linossier; Raymonde Linossier; H. de Wilman Grabowska; Charles-Henri Marchal; Henri Maspero; Serge Eliseev (1932). Asiatic Mythology:A Detailed Description and Explanation of the Mythologies of All the Great Nations of Asia. p. 194. ISBN 978-81-206-0920-4. ^ a b "Angkor Wat, 1113–1150". The Huntington Archive of Buddhist and Related Art. College of the Arts, The Ohio State University. Retrieved 27 April 2008. ^ Coedès, George (1968). Walter F. Vella (ed.). The Indianized States of Southeast Asia. trans.Susan Brown Cowing. University of Hawaii Press. p. 164. ISBN 978-0-8248-0368-1. ^ Masako Fukawa; Stan Fukawa (6 November 2014). "Japanese Diaspora – Cambodia". Discover Nikkei. Retrieved 18 October 2015. ^ Abdoul-Carime Nasir. 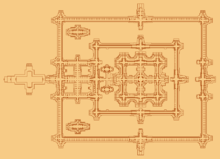 "Au-dela du plan Japonais du XVII siècle d'Angkor Vat, (A XVII century Japanese map of Angkor Wat)" (PDF) (in French). Retrieved 18 October 2015. ^ "History of Cambodia, Post-Angkor Era (1431 – present day)". Cambodia Travel. Retrieved 18 October 2015. ^ Aveni, A.; Romano, G. (September 1994). "Orientation and Etruscan ritual". Antiquity. 68 (260): 545–563. doi:10.1017/S0003598X00047049. ISSN 0003-598X. ^ a b Glaize p. 59. ^ a b c Russell Ciochon & Jamie James (14 October 1989). "The Battle of Angkor Wat". New Scientist. pp. 52–57. Retrieved 22 November 2015. ^ Falser, Michael: Clearing the Path towards Civilization – 150 Years of "Saving Angkor". In: Michael Falser (ed.) Cultural Heritage as Civilizing Mission. From Decay to Recovery. Springer: Heidelberg, New York, pp. 279–346. 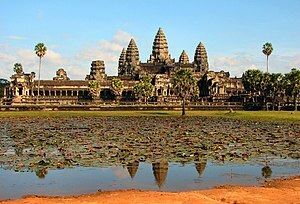 ^ "Recent research has transformed archaeologists' understanding of Angkor Wat and its surroundings". University of Sydney. 9 December 2015. Retrieved 10 December 2015. ^ Fleming, Stuart (1985). "Science Scope: The City of Angkor Wat: A Royal Observatory on Life?". Archaeology. 38 (1): 62–72. JSTOR 41731666. ^ a b Freeman and Jacques p. 48. ^ Coedès, George (1968). Walter F. Vella (ed.). The Indianized States of Southeast Asia. trans.Susan Brown Cowing. University of Hawaii Press. p. 162. ISBN 978-0-8248-0368-1. ^ a b Higham, The Civilization of Angkor p. 118. ^ Transcript of Atlantis Reborn, broadcast BBC2 4 November 1999. ^ "How countries around the world celebrate the spring equinox". www.msn.com. Retrieved 4 October 2018. ^ "Ankgor Wat, Cambodia". www.art-and-archaeology.com. Retrieved 4 October 2018. ^ a b Freeman and Jacques p. 49. ^ a b Freeman and Jacques p. 50. ^ Sappho Marchal, Khmer Costumes and Ornaments of the Devatas of Angkor Wat. ^ Ghose, Tia (31 October 2012). "Mystery of Angkor Wat Temple's Huge Stones Solved". livescience.com. ^ "Lost City of Angkor Wat". National Geographic. ^ Uchida, Etsuo; Shimoda, Ichita (2013). "Quarries and transportation routes of Angkor monument sandstone blocks". Journal of Archaeological Science. 40 (2): 1158–1164. doi:10.1016/j.jas.2012.09.036. ISSN 0305-4403. ^ Lehner, Mark (1997). The Complete Pyramids, London: Thames and Hudson, pp. 202–225 ISBN 0-500-05084-8. ^ "Considerations for the Conservation and Presentation of the. Historic City of Angkor" (PDF). World Monuments Fund. p. 65. Archived from the original (PDF) on 16 May 2011. ^ "The Siem Reap Centre, Cambodia". EFEO. ^ "The Modern Period: The creation of the Angkor Conservation". APSARA Authority. ^ Cambodia. Lonely Planet. 2010. p. 157. ISBN 978-1-74179-457-1. ^ Kapila D. Silva; Neel Kamal Chapagain, eds. (2013). Asian Heritage Management: Contexts, Concerns, and Prospects. Routledge. pp. 220–221. ISBN 978-0-415-52054-6. ^ "Activities Abroad#Cambodia". Archaeological Survey of India. ^ Phillip Shenon (21 June 1992). "Washing Buddha's Face". New York Times. ^ Kapila D. Silva; Neel Kamal Chapagain, eds. (2013). Asian Heritage Management: Contexts, Concerns, and Prospects. Routledge. p. 223. ISBN 978-0-415-52054-6. ^ Michael Falser, ed. (2015). Cultural Heritage as Civilizing Mission: From Decay to Recovery. Springer International. p. 253. ISBN 978-3-319-13638-7. ^ Albert Mumma; Susan Smith (2012). Poverty Alleviation and Environmental Law. ElgarOnline. p. 290. ISBN 978-1-78100-329-9. ^ "Royal Decree establishing Protected Cultural Zones". APSARA. ^ Yorke M. Rowan; Uzi Baram (2004). Marketing Heritage: Archaeology and the Consumption of the Past. AltaMira Press. p. 123. ISBN 978-0-7591-0342-9. ^ Hing Thoraxy. "Achievement of "APSARA". Archived from the original on 3 March 2001. ^ German Apsara Conservation Project Archived 5 February 2005 at the Wayback Machine, Conservation, Risk Map, p. 2. ^ "Infrastructures in Angkor Park". Yashodhara no. 6: January – June 2002. APSARA Authority. Archived from the original on 26 May 2012. Retrieved 25 April 2008. ^ "The Completion of the Restoration Work of the Northern Library of Angkor Wat". APSARA Authority. 3 June 2005. Retrieved 25 April 2008. ^ Gaylarde CC; Rodríguez CH; Navarro-Noya YE; Ortega-Morales BO (February 2012). "Microbial biofilms on the sandstone monuments of the Angkor Wat Complex, Cambodia". Current Microbiology. 64 (2): 85–92. doi:10.1007/s00284-011-0034-y. PMID 22006074. ^ Guy De Launey (21 August 2012). "Restoring ancient monuments at Cambodia's Angkor Wat". BBC. ^ Justine Smith (25 February 2007). "Tourist invasion threatens to ruin glories of Angkor Wat". The Observer. ^ "Executive Summary from Jan–Dec 2005". Tourism of Cambodia. Statistics & Tourism Information Department, Ministry of Tourism of Cambodia. Archived from the original on 13 April 2008. Retrieved 25 April 2008. ^ "Tourism Statistics: Annual Report" (PDF). Ministry of Tourism. p. 60. ^ "Tourism Annual Report 2012" (PDF). Ministry of Tourism. ^ a b c d e f g h Winter, Tim (2007). "Rethinking tourism in asia". Annals of Tourism Research. 34: 27–44. doi:10.1016/j.annals.2006.06.004. ^ "Borobudur, Angkor Wat to become sister sites". 13 January 2012. Albanese, Marilia (2006). The Treasures of Angkor (Paperback). Vercelli: White Star Publishers. ISBN 978-88-544-0117-4. Jessup, Helen Ibbitson; Brukoff, Barry (2011). Temples of Cambodia – The Heart of Angkor (Hardback). Bangkok: River Books. ISBN 978-616-7339-10-8. Wikivoyage has a travel guide for Angkor Archaeological Park.